According to the requests provided by the customer, the main objective of laroccasolutions was to acquire some knowledge of the most advanced research of RFiD systems for automotive applications, from which to start the development of the antennas and study the distribution of the electromagnetic field. We have established modeling and simulation of the system, and select the appropriate boundary conditions, mesh options and that the most influencing elements in the propagation of the magnetic field. This assumption implies that total attenuation will be the superimposition of the effects due to power-distance relation and other effects due to the vehicle. 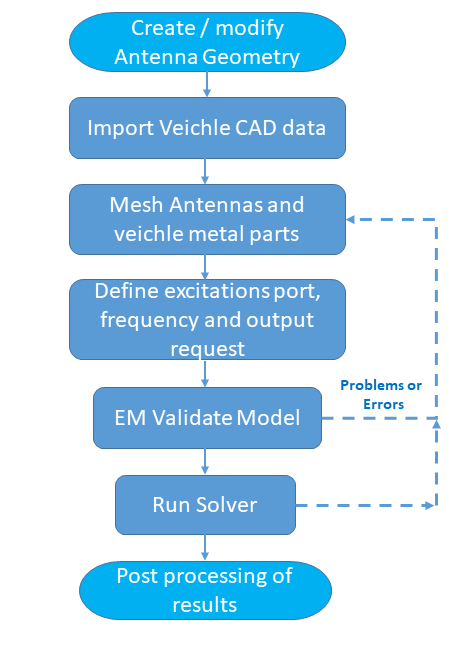 Through Computational Electromagnetics (EM) simulations, the antenna response was understood and allowed to perform various studies rapidly with the change of the antenna parameters for optimal performance. 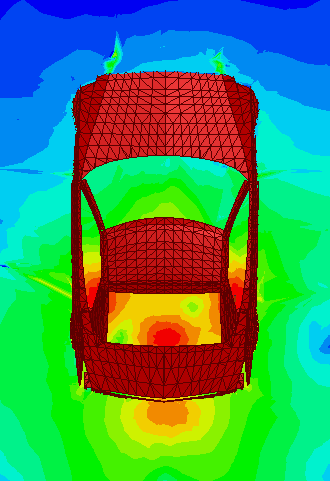 We obtained the distribution of the three-dimensional vehicle electromagnetic field affected by the antenna, and analyze the local electromagnetic field distribution in the critical regions. These 3D maps of electromagnetic distribution fields data was used for localize the fob as being either inside or outside of the car. If the system determines the fob is outside, it unlocks the door. If the system senses the fob being inside the car, it starts the engine.